If you're as old as I am, then you will certainly remember the 1970s TV series in which Diana Prince was played by Lynda Carter. 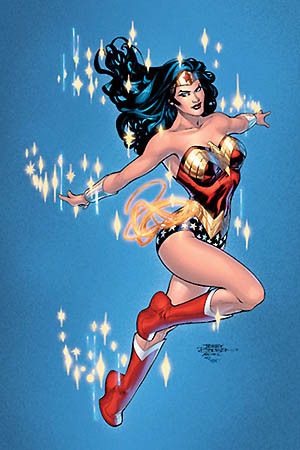 I also remember how she magically transformed into Wonder Woman by spinning around. She would also whip out her lasso to deal with the bad guys. The Wonder Woman U.S. TV Series was based on the DC Comics comic book character that was created by William Moulton Marston. It starred Lynda Carter as Diana Prince who transformed into Wonder Woman. A TV Movie entitled Wonder Woman (with Cathy Lee Crosby playing the leading role) aired on American television in 1974. In this version the heroine did not resemble the superhero character and she had no super powers and was blonde - a bit boring then, really! Understandably, this movie did not translate to a series. 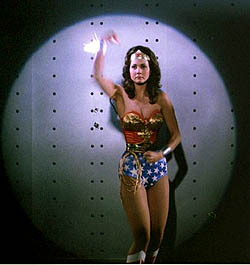 Wonder Woman ran for three series on ABC from 1976 to 1979 and there were a total of 59 episodes. It originated from the 1975 television movie The New, Original Wonder Woman (1975), which also starred Linda Carter as this was also the title of the series. However, for seasons two and three (1977 to 1979) the series was entitled The New Adventures of Wonder Woman, and season three was aimed at a more teenage audience with the latest, cool fads such as disco music and skateboarding making an appearance. The American actress was born in Phoenix, Arizona on July 24th 1951, and first gained notoriety when she won Miss World USA in 1972. She then went on to pursue a career as an actress, and appeared in several TV shows including one episode of Starsky & Hutch (as Vicky) and the mystery series Matt Helm as Bobby Dee. Carter also played Bobbie Jo Baker in the 1976 movie Bobbie Jo And The Outlaw and appeared naked in one scene. Carter gained her first major acting role as Wonder Woman/Diana Prince and starred in 1 movie and 59 episodes. During the 1980s, Carter had roles in numerous television shows and TV movies. She appeared as herself in an episode of The Muppet Show in 1980, and played Brooke Newman in the TV film The Last Song during the same year. In 1983, Carter played Rita Hayworth in the TV movie Rita Hayworth: The Love Goddess. This video clip features the opening titles from the original 70s TV series, which should bring back a few memories. Of course, being a young lad growing up in the seventies it really wasn't considered a very cool TV show for boys to watch. In the school playground you criticised everything about the programme with your mates, even though we all secretly enjoyed watching it! 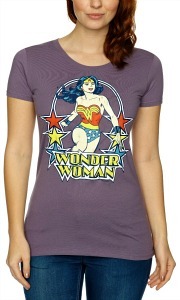 Wonder Woman made her very first appearance in the DC Comics publication All Star Comics No.8 in December 1941. She was created by William Moulton Marston. As with just about every TV series aimed at a younger audience, there was plenty of costly mechandise launched, too. Warner Bros asked Mego to develop a toy doll and they actually made a mask from Lynda Carter's face to use on the doll. The first run of original dolls include Carter's name, but, apparently, her name was then taken off so they didn't have to pay her any royalties - ouch!